Rent Twenty Two Gallery | Corporate Events | Wedding Locations, Event Spaces and Party Venues. Since 2003, an intimate original fine art gallery nestled in Philadelphia's premier neighborhood, Rittenhouse Square, representing emerging and established local artists in a variety of artistic mediums, including the 50 years of photographic artwork by Bruce Murray, Sr. (1893-1969). Perfect white box retail space with great light, nestled in an amazing location in Philadelphia’s premier neighborhood, Rittenhouse Square. Surrounded by nearby boutique shops and restaurants, this space benefits from great foot traffic and is ideal for emerging brands and designers to host unique events. The space is located on street level, and has a large front window and glass front door, allowing easy visibility inside the space. In the rear is an office area and bathroom. The interior has a classic wood floor and clean white walls perfect for retail and art exhibitions. There is a 22 foot contiguous wall and a professional art hanging system throughout, perfect for art exhibitions. The 11 foot ceiling height give the space an even larger feel. A 7’ x 7’ front window and window transoms provides plenty of natural light throughout the day, and track lighting throughout the space can be positioned as needed. The polished real wood floors stay cool in the summer and the space has it’s own dedicated heating and cooling for total comfort control. We also have the availability of gallery attendants which could be great for longer term art exhibitions, where you are not available to attend to the gallery for the entire show term. We can also offer sales & credit card acceptance for an additional fee. This wonderful space is available for art shows, pop ups, presentations, launch parties, classes, readings, meetings, events, etc. 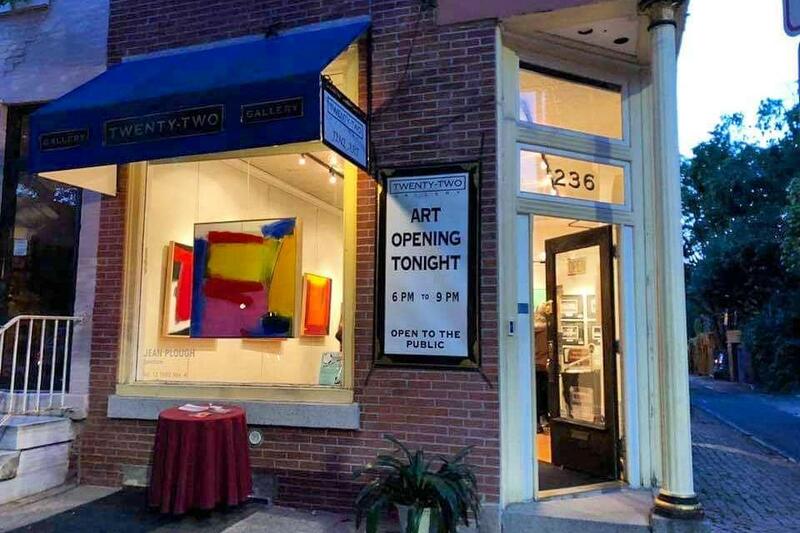 Since 2003, Twenty-Two Gallery has been showing local, emerging and established artist’s artwork in many mediums. It is also the home of the photography of the owner’s grandfather, Bruce Murray, Sr. (1893-1969). This photographic archive spans over 50 years, capturing decades of historical, sports and Americana imagery in fine art black & white original photography, many from the Philadelphia area.